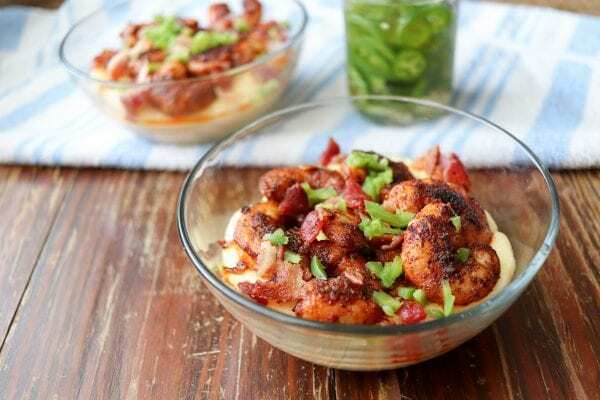 A true southern classic: Creamy smoked gouda grits are topped with blackened shrimp, bacon and sprinkled with pickled jalapenos. Oh hello there. 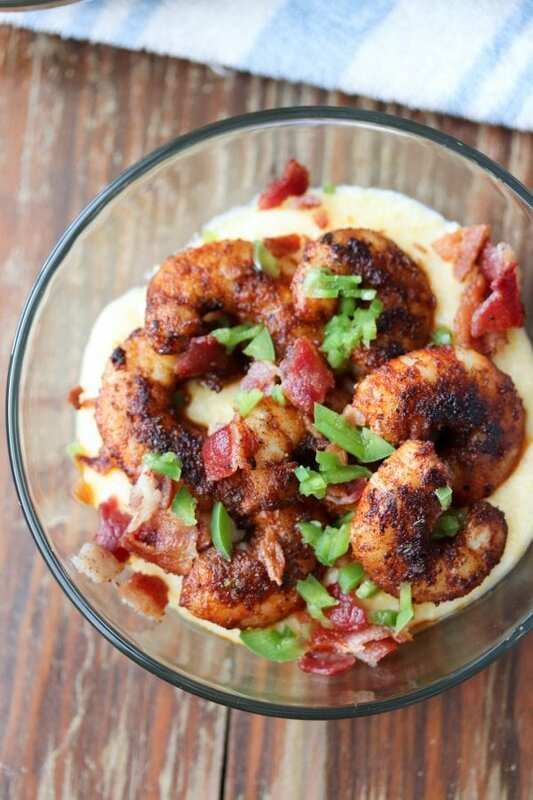 Today’s a fantastic day because we’re talking about blackened shrimp and grits made with smoked gouda cheese. 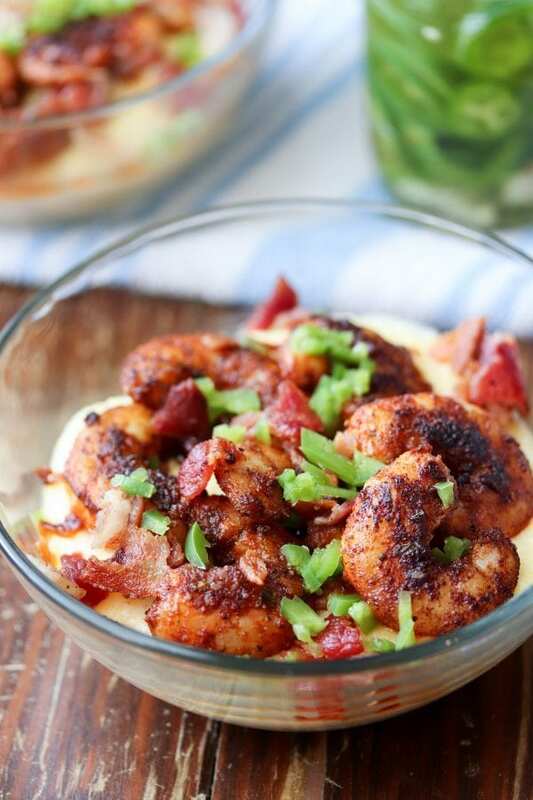 Because who doesn’t love flavorful shrimp paired with creamy cheese grits and sprinkled with bacon? I can’t think of anyone who doesn’t like that. Ken even liked these shrimp and grits and he’s not a fan of grits because he was raised in Minnesota and supposedly Minnesota people don’t like grits. But give ’em smoked gouda grits and they’ll beg for seconds. This recipe shows my true southern colors. I grew up in Florida and my dad was from Georgia. My mom was from up north. Mom caught onto southern cooking after she moved to Florida in the 70s. Chicken and dumplings, Gulf shrimp, BBQ, fried okra and grits of any sort were regulars at our dinner table. When we had fish or seafood, 99.9% of the time it was served with cheese grits. Cheese grits are da bomb. For reals, yo. Inspiration for this blackened shrimp and grits comes from a dish at one of my favorite restaurants, District Table and Bar. District is a farm to table southern restaurant in Stuart, FL whose menu includes fried chicken and waffles, diver scallops, locally caught fish, one of the best burgers ever, and jalapeno cheddar shrimp and grits. I’ve ordered the shrimp and grits a few times. It never disappoints. So anyways, I made some cheese grits with smoked gouda cheese, butter, salt and pepper. Then I cooked some bacon. After that, I seasoned shrimp with blackened seasoning and cooked it in the bacon fat. Finally, I assembled everything in bowls and sprinkled with pickled jalapenos. Then Ken and I enjoyed the shrimp and grits for lunch. WIN! Make the grits. Bring two cups of water and 1/2 tsp salt to a boil. Add 1/2 C grits, cover and cook 5-6 minutes. Stir in the butter, smoked gouda cheese and more salt to taste. If the grits are too thick, stir in more water until desired consistency is reached. Cook the bacon. While the grits are cooking, cook 2 slices of bacon over medium high heat in a 10 inch skillet. When the bacon is done cooking, remove from the pan and set on top of paper towels. Reserve the bacon fat for cooking the shrimp. Once slightly cooled, chop into small pieces. (reduce skillet heat to medium). Cook the shrimp. Season the shrimp with blackened seasoning and toss to coat. Add the shrimp to the skillet with the reserved bacon fat and cook over medium heat 2-3 minutes per side. Divide the cooked grits between two bowls. Divide the cooked shrimp and chopped bacon between each bowl. Garnish with chopped pickled jalapenos. Serving size is one bowl. This sounds soooooo good. I love anything with gouda cheese. I want to try this right now if I could! Shrimp is one of my favorite foods. This looks so delicious. Thanks for sharing on More the Merrier Monday link party!! oh boy oh boy oh boy I have a good friend that would love this dish gonna share with him. My husband doesn’t like grits either. I’ll have to make your recipe to see if I can change his mind! Thanks! Ooh, yum! 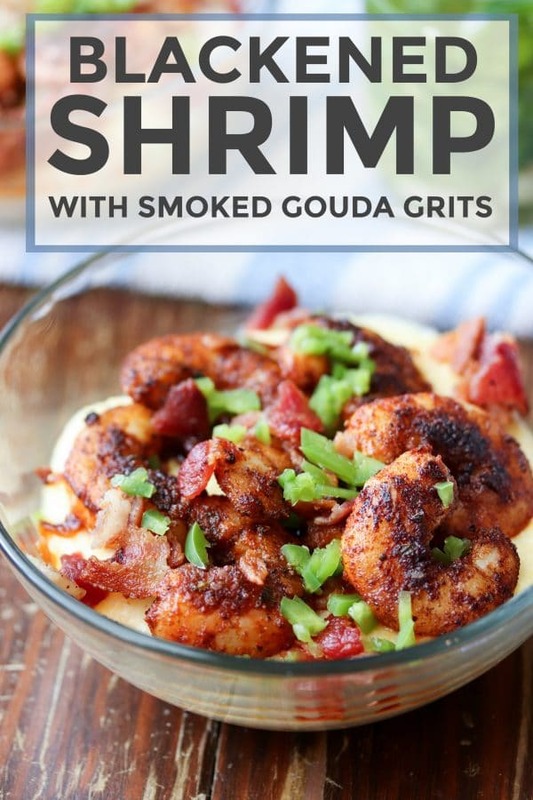 I have a recipe for sweet and spicy shrimp over cheese grits on my blog which is really delicious but I love the idea of using smoked gouda. In fact, just this week I did a smoked gouda potato soup…with bacon, of course. I’m definitely going to give your recipe a try. Feel free to check out mine, too! Yep, cheese grits are da bomb! Growing up in Georgia, I’m a shrimp and grits lover too. Your recipe sounds fabulous! So glad you share with us at Merry Monday! Saving this one and sharing too. 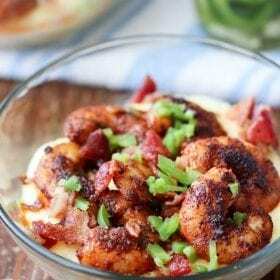 I just pinned this fabulous recipe for Blackened Shrimp and Grits! Thanks so much for sharing your post with us at Full Plate Thursday! Have a great week and come back to see us real soon! You had me at blackened shrimp! Yum! Thank you for sharing with us at FF!